Toss the first five ingredients together in a large bowl. Add lime juice, olive oil, and salt, and stir well. Sprinkle with chopped mint leaves before serving. Papayas were first referenced in 1526 by the Spanish chronicler Oviedo, after discovering this fruit on the Caribbean coasts of Panama and Colombia. Christopher Columbus is said to have called papayas the "fruit of the angels." Sometimes thought of as an exotic fruit, papayas are native to tropical areas, including Hawaii, the only place they're grown in the U.S. This sweet, succulent fruit contains about 300% of the recommended daily amount of vitamin C, known for its infection-fighting abilities, and vitamin A for healthy skin, mucus membranes, and vision. Other nutrients in papaya include folate, dietary fiber, potassium, essential B vitamins, and several flavonoids, including betacarotene, shown to help protect against lung and mouth cancer. 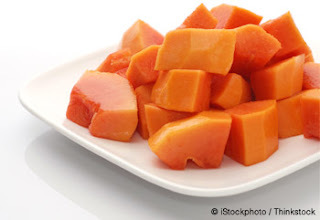 One of the most important ingredients in papaya is the enzyme papain, shown to be effective against a number of stomach and intestinal problems, from expelling parasites to easing the symptoms of irritable bowel syndrome. While it's good as an addition to other fruits, one of the best ways to enjoy papaya fruit is to cut it like a melon and eat it on its own.